Gold Plated Earrings 21k on 925 Silver Filigree, "Starlit Suns"
Starlit suns augur prosperity in a design by Peru's Giuliana Valz-Gen. She masters filigree techniques to create the illusion of concentric stars within three full moons. 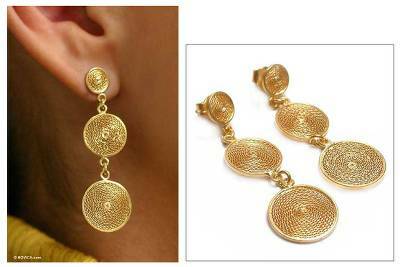 The silver earrings are crafted by hand and plated with 21k gold. You can find gold plated filigree dangle earrings 'Starlit Suns' by Giuliana Valz-Gen in jewelry categories such as No Stone Earrings, Gold Earrings, Gold Plated Earrings, Silver Earrings, Sterling Silver Earrings, Filigree Earrings and Dangle Earrings. Enjoy exploring these sections for other Novica treasures. I am so pleased with these earrings. They look exactly as pictured, and they feel just right. I appreciate the workmanship and enjoy wearing them.